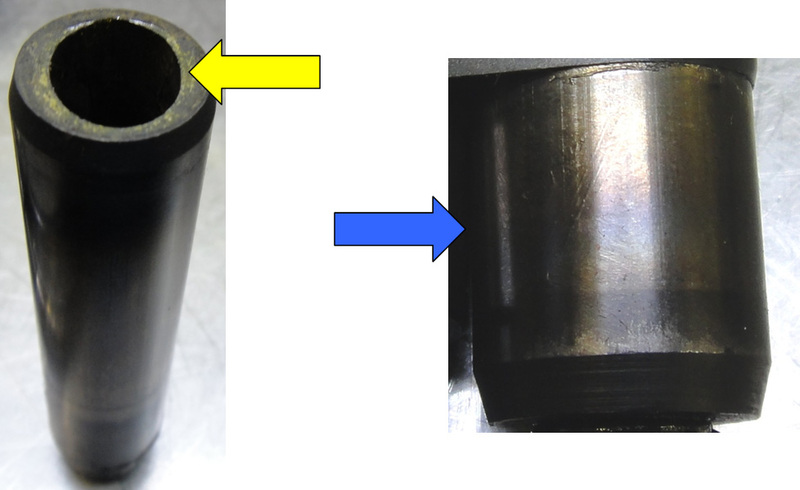 The first two pictures show the wear in the lower part of the valve guide closest to the valve head. The second picture shows the heat discoloration on the lower part of the guide was caused from excessive heat. Excessive guide wear most likely occurred from improperly set valve bridges and maintenance issues. 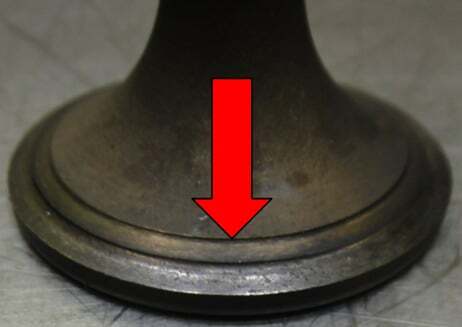 This picture shows the seat wear on one of the valves. Most of the valves had similar wear and a few had severe wear. Valve seat wear will reduce valve lash and effect when a valve opens and closes which changes timing. It also effects scavenging, valve overlap and both valve and valve seat cooling. Lack of proper scavenging can also cause excessive heat buildup in the exhaust ports and damage the valve guides. If there is a variation in wear of the two valves that share a common crosshead it can create side loading of the valves and wear in the valve stems. Crossheads must also be inspected prior to installation for both wear and orientation.